I woke up this morning and felt the morning air much cooler than during our summers. It seems that Fall has finally come around to the Rio Grande Valley. I remember days when we still had 100 degree weather in October. I'm not longing for those days to come back, mind you. I am perfectly happy having Fall weather in the Fall than later in December. Of course, this makes me wonder, with Fall coming so early to the Rio Grande Valley this year, if Winter will be colder than usual. Hopefully the weather remains temperate in its chill as it was in its heat this year. I think that cooler weather gives us opportunity to wear more interesting clothes that we do not have opportunity to use the rest of the year, such as jackets, sweaters, scarves, and hats. I do see people walking around with beanies in the summer heat. Fools. Cooler weather also makes it pleasant to be outdoors during the daytime rather than having to wait until the evening. I think I will enjoy the Winter of 2014. It seems like it has been raining for weeks in the Rio Grande Valley. The weather forecasts have almost exclusively hovered around something like: Chance of Showers. High 90. Low 75. There have been a few days here and there where temperatures have climbed up to 100 degrees, but they have been very few compared to other years when it has been 100 F through October. It's as if all the rain that we have not had these many years has suddenly decided to pay back its debt. Out of curiosity, I looked up the Falcon Reservoir level, which is often used as an indicator of drought conditions. Despite all the rain we have been receiving, the Falcon Lake level is still about 30 ft below capacity. In fact, we are below 2010 and 2011 levels at the same time of year. But, we are above 2012 and 2013 levels by a few feet. We seem to be somewhat following seasonal variability, in terms of lake level. In short, not quite drought, but not quite in breathe easy territory. So, what has been the result of so much rain in the Rio Grande Valley? Certainly, everything has greened up rather nicely with so much rain. We have grown accustomed to yellow landscapes after so many years of little precipitation. It is a nice change to see the local flora thriving and flourishing. Of course, the rains are also responsible for bringing something that we certainly have not missed, mosquitoes and flies. Certainly, we had flies during the dry times; but, not to the same extent. The same goes for mosquitoes, there may have been the occasional mosquito; but not the roving squadrons we see today. To be sure, local health officials have been dispatching trucks to spray for mosquitoes once it became evident that it would rain for more than two days in a row. Municipalities like McAllen have also been enforcing weedy lot ordinances to ensure that citizens mow down their jungles to help control mosquitoes. Speaking of growing populations, have you seen all the potholes that have proliferated around town? It seems as though there were benefits to the drought. My only other pondering on the rains is what effect this will all have on the cracked foundations that have proliferated from our shifting clay soil? It has been sad to drive around town and see huge cracks making their ways up the walls of people's homes. Even the place I'm renting has had some issues with the shifting soil. The house is wood frame, which surprisingly doesn't help. Some of the doors get stuck, sheet rock has cracked here and there, and joints between the concrete and house have separated. It looks like we will have more rain in the foreseeable future. With any luck, we'll skip the 100 degree weather for the rest of the year, which is my real interest. This morning, my oldest and I took the Valley Metro bus from Mission to McAllen. I was headed to 10th and Trenton; she was headed to +The University of Texas-Pan American (UTPA). I thought I had blogged about riding the bus before; but, I don't see any evidence. It must have been put on +Google+ or on Facebook somewhere. This must have been about 2 or 3 years back when I worked in Edinburg. The result of the previous bus riding was that I couldn't do it long-term. I was spending way too much time doing nothing during the ride, and it takes 2 hours to get from Mission to Edinburg without changing buses. The Valley Metro bus meanders through Mission, goes to the McAllen bus depot, then meanders through Pharr before ending up in Edinburg. The return trip involves equal meandering. I tried using that time to do work, read, or whatever; but, batteries only get you so far. My batteries would be drained by the time I got to work. In addition, it was eating up my data plan. This time around, I found that my experience getting to work in north McAllen still took me about 2 hours; but, it wasn't spent on one bus. There is a bus transfer involved, getting off the Valley Metro #20 and hopping on the McAllen Metro #2 or #3. They both take roughly the same route, but will deposit you on opposite sides of the street. The advantage this time around is that there is Wi-Fi at the McAllen bus terminal and some spots along the route. Also, while waiting for my bus transfer, I could eat breakfast at the +SUBWAY Restaurants franchise at the depot. My daughter was fortunate that there is now a bus, the Metro Connect Green Line, that eliminates the Pharr meandering. It takes her straight to the University, or straight-ish rather. There is an unpredictable stop at the McAllen Library. She was supposed to take the bus to the library after school, where her mother could pick her up after work; but, the bus didn't stop there as it did on the way to school. So, we had to pick her up at the bus depot in the afternoon. The bus ride itself is not unpleasant. Most of the passengers aren't a gloomy lot. They will spark up a conversation to make the time pass on their journey. I think the biggest problem is that a 15 minute drive takes 2 hours. McAllen does a great job of running buses every hour on the hour. The predictability makes it so that you can work something out. The only time it becomes an all-or-nothing event is if your stop is at the far end of the loop where the bus turns around. If you miss the bus, you can't cross the street and grab the next one. But, you can avoid that by being on time. I don't want to be harsh on Valley Metro because they are doing rather well considering that they are serving most of the communities in the RGV. In addition, they are rather predictable even though they offer the additional service of detouring from their main routes for certain situations. However, the problem today is the same problem I had a couple years ago when I tried taking the bus to work in Edinburg. That problem is that it's asking too much from one route. I get on the bus at 6:30. If I were to miss it, I could walk a couple blocks and catch it, the same bus, at around 6:45. Or, my wife could drop me off a little before 7 as she drops off my daughter at school at another stop to catch the same bus less than a mile away. Valley Metro is making one bus do the job of several. That bus has to meander through town to provide service to the entire community before moving on to the next. Again, one can't be harsh on Valley Metro because the bus does get full and there is indeed a need they meet. But, if you miss the bus at any of its meanderings, you're going to wait 2 hours for the next one. While we're on the subject of two hours, referring to the 2 hour commute, it doesn't matter how I jigger the schedule, somehow it always ends up taking me 2 hours to get from Mission to my ultimate destination in McAllen, or the reverse. If you add it up, that's four hours of commute per day. That's half a work day every day. That's twenty hours per week, a part-time job. So, why bother riding the bus? I think this is a personal question in some regards. It will vary from person to person. For some people, the bus is their only reliable option in which they aren't imposing on the kindness of others. For some people, . . ., well, they're damned hipsters. They want to save the planet and live simply. In short, your mileage may vary from mine. In my case, my family is a one-vehicle family. There are certain challenges that result from two people juggling the need for one vehicle. Having two vehicles creates a cash outflow we would rather avoid, that is to say fuel, insurance, taxes, maintenance, and other expenses. A bus option facilitates the morning commute and custody of the vehicle. In addition, I am almost too happy to give up having to drive. I now have a Kindle that affords me plenty of reading and battery life so that I can spend time reading improving books and other materials when I would have otherwise been driving. In the afternoon, it is easier for Mrs. Mata to pick me up at work and then go pick up our children. But, even if she or I had some other after work commitment, having a bus option to go home would be helpful for the rare occasion. And, I think that is what describes our situation. Riding the bus is an option that helps us out of scheduling dilemmas. I'll write about personal multimodal transport later, as I'm considering other options that do not involve buying another car; but, let's stick to bus riding today. I have lived in Austin, Texas a few times in my life. I had a vehicle most of those times, which I hardly used because their bus system is well developed. I really enjoyed the freedom of hopping on and off a transport without regard to parking, gas, traffic, or other matters that a driver endures. I find myself wanting the bus system in the Rio Grande Valley to resemble that +Capital Metro experience. We aren't there yet. Our bus systems need more riders to grow to that level. Yet, the time commitment is a detractor from the casual rider like myself who enjoys the practice of good public transport. Ideally, I would like buses every half hour. But, I realize that it means a big capital investment and tons of politics given that our communities are a collection of fragmented fiefdoms. I think McAllen will most likely grow their public transport on their own. I think Valley Metro needs the most help through increased ridership. Valley Metro is in that chicken and egg situation where they need more riders to justify greater investment; but, they need more investment to attract more riders. The two hour thing is just murder when it comes to using their buses. That really is the biggest detractor. I think, at the very least, they could have hourly buses for communities surrounding McAllen, specifically Mission, Edinburg, and Pharr, so that the schedules mesh better. I will continue to ride the bus in the mornings despite the two hour commitment, thanks to McAllen's Public WiFi service. Was Today a Crazy Day in the RGV, or What? Today seemed a particularly crazy day in the news here in the Rio Grande Valley. Let's start off with the first day of school. Today, parents, children, and the community at large scrambled around like ants after their hill is kicked over. Police everywhere watching trouble spots where people get gnarled up dropping off their kids, and watching for dummies talking on their phone (or texting) through school zones. So, the craziness started with people trying to readjust to the school routine. Then, apparently, Weslaco's water was contaminated overnight because of too much demand. Their water processing could not keep up. I don't know exactly what that means, perhaps something with backflows where water is sucked back into the water lines, thus making the quality questionable. Who knows? In any case, the whole city had to lay off tap water. The schools had to order bottled water. Restaurants shut down. Dogs and cats...never mind. The City of Weslaco issued a notice overnight, as if anybody listens to or reads the news while screaming at the kids to put on their damned shoes and get in the car. The Hidalgo school district found mold in some classrooms and had to cancel classes for those schools (school?). That's a good thing, right? Well not for parents who have been dreaming about getting rid of their kids since May. That's the sort of thing that trifles with their emotions. I'm surprise there were no assaults. Speaking of assaults, apparently there was a kidnapping and assault in Donna. There were ambulances, police, and helicopters involved. Even +KGBTexas .communications and other media went out to cover the event. Last I heard, there was a standoff and some woman escaped. I don't know the details because I have a job and only have time to see headlines stream by. Speaking of streams, I saw a photo of a rolled over vehicle on the expressway. There was another vehicle that caught fire. And, to top it off, Eastbound lanes were shut down on the Expressway in Mission. All of this is what I could gather just from headlines zipping by. I'm sure there was much more craziness; but, I'm afraid to look. Just yesterday, while thinking about the heat and the possibility of rain, it occurred to me that there have been no tropical storms nor hurricanes this year. 2013 was a very slow year with only two hurricanes and fourteen tropical storms. Nothing major. So, how is this year looking? First, I discovered that Hurricane Season officially starts on June 1 and ends September 30. This means that it has been only about three weeks since the season started. Thus, not enough time for these random events to cook something up. However, given that we had an unusually long winter, and that such storms love heat energy, it may be possible that we will have another slow year. The predictions by people who keep stats say that we should have 5 hurricanes this year, with 2 major ones hitting land. And we should have about 10 tropical storms. If you do the numbers, that gets us up to the letter J in storm names. Given the history of storms, we can likely expect both the Yucatan and Caribbean islands to get run over. As for landfall on the rest of North America, it's anybody's guess. We should prepare for a storm, regardless. It doesn't hurt to be stocked up on what you might need. I don't think cleaning mold and mildew from your window air conditioner is a problem specific to the Rio Grande Valley. After all, there are plenty of other places with high temperatures and high humidity. However, given that there are so many of us who rely on window units to cool our homes, allow me to share some experience in cleaning these things out. Obviously, our window units grew some black stuff on the blower and its enclosure. This generated allergies in my little one, who is sensitive to such things. Not having my own laboratory, I couldn't tell you if it is mold or mildew. It matters not. Other than replacing the window unit every couple months, I've tried washing the unit with Clorox products. I figure bleach kills everything; but, I guess it doesn't. We still had to use cotton swabs to wipe and scrub surfaces on the blower and enclosure, which is almost impossible on some models. You can't disassemble them enough without separating welded parts. We have also tried professional AC cleaner sprays, which foam up and you wash off. The black stuff remains. If I couldn't remove the black stuff, then perhaps I could filter the allergens. At first, I tried putting a HEPA filter on the air intake and exhaust. This works for maybe a day until the intake gets clogged. After that the unit struggles to blow out cold air. It freezes up and stops blowing air altogether. I tried being less aggressive on the intake, using a foam, washable filter and a HEPA on the exhaust. This works better; but, you still have to change the HEPA filter every 10 days. You'd be amazed at the crud that it catches. After much research, I found people recommending something so obvious, I didn't think of it. They recommended Lysol Mold & Mildew Remover. We tried it tonight to see if it works. Unlike the other bleach products, this one starts working within minutes. You do not have to sit around scrubbing all the surfaces to remove the mold or mildew. The black stuff either falls off or washes off with a water hose. If you or a child of yours suffers from bad allergies and must use window air conditioning units, I would recommend using the Lysol spray to clean out the growing mold or mildew. This stuff is almost inevitable given the high humidity in the RGV. The combination of condensation and dust in the air create the perfect conditions, substrate for you geeks, for mold and mildew to build up and release allergens. But, don't stop there. I also recommend you stop at the local Home Depot or Lowe's to buy a really good air filter. By some magic of marketing, a small filter costs as much as a large one. I buy the large ones and cut them up. For the same $20, I can change the filter pieces several times. A cheap foam filter will have to do for the air intake. Unfortunately, the high quality filter that catches allergens coming out of the AC also slows down the air flow drastically. Stopping up both ends severely reduces the efficiency of the unit, making it run continuously without cooling off your home. The best balance is to clean the unit and change filters frequently. I recommend spraying down the fan and fan enclosure once per month when you are using the air conditioner. I recommend changing the filters every 10 to 15 days. I tried changing the filters once per month; but, they start to grow their own mold and mildew, adding to your allergy problem. When it comes to health, the minor inconvenience of changing filters and washing out your AC is well worth it compared to buying allergy medicine, decongestant, cough medicine, tissues, and albuterol. Been there. Done that. I hope this helps you make things better in your home. The RGV Life Twitter feed was previously fed news updates through Topix. Unfortunately, it required clicking on the link, landing on a summary page, and then having to click on another link for the full story. The feed has been updated to use Google News as the source in the hopes that only a single click will be needed to reach the news source rather than require a second click to reach the original post. The Hidalgo County Metropolitan Planning Organization will meet Monday, April 14, at 6 pm in the UTPA Community Engagement (ITTB 1.210) building. The MPO relies on public involvement to advise local governments and leaders on what they can do to make our communities better and safer for pedestrians and bike riders. 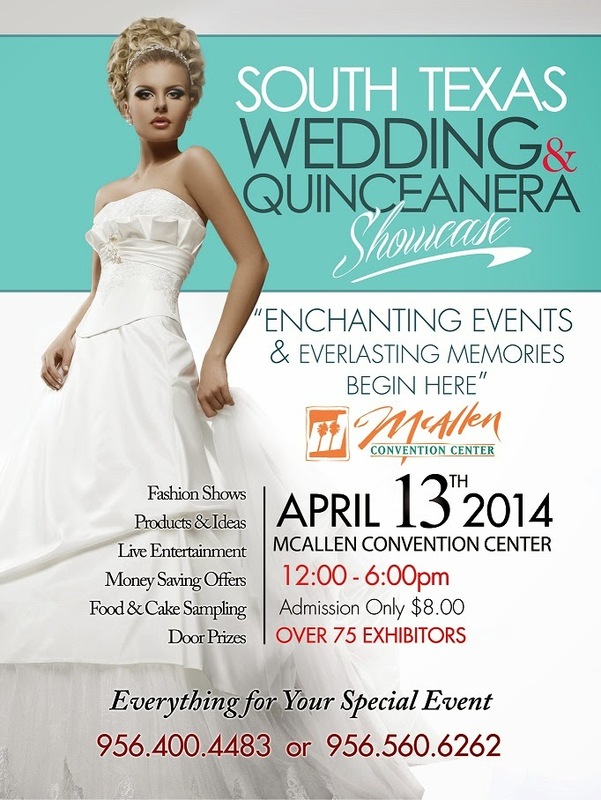 South Texas Wedding & Quinceanera Showcase starts tomorrow from noon to 6 pm at the McAllen Convention Center. The event features more than 70 exhibitors. Tickets to the event are only $8 per person. Attendees can expect to see fashion shows to highlight products. In addition, there will be live entertainment, special offers, food, and prizes. An event like this is a great preparation for summer brides who are looking for that something special for their upcoming wedding. Be sure not to miss it. If you follow RGV Life on Twitter, you will see an increase in posts with Rio Grande Valley headlines, weather, and event announcments. This is a recent effort to make the RGV Life online presence more useful to the community. Unfortunately, it requires a greater time commitment to write blog posts, otherwise that would be the preferred method of announcing things. Still, keep checking back as more updates and modifications are made. Weslaco puts on their annual Texas Onion Festival for 2014. The first TEDx event in McAllen gets off to a good start. Weslaco invites the public to participate in the Texas Onion Festival's popular Onion and Salsa Recipe Contest, to be held on March 22 at the Weslaco City Park. There will be competitor categories based on age. Entry forms and more details are available at http://www.weslaco.com. The registration deadline is Friday, March 14, 2014. We live in a sub tropical climate. I never knew exactly what that meant. I still don't. But, I can definitely tell you that the winter weather has resulted in tall grass in my yard. Well, grass is a bit generous; weeds. These past years have been rough on yards with the constant drought. If you drive around the Rio Grande Valley, you would have seen a bunch of brown yards and a few dirt yards. There wasn't enough rain to keep a healthy lawn. We could have watered our lawns; but, there were also watering restrictions. So, what happens? You fall out of the habit of mowing your lawn. If your grass is just barely alive and growing very little in a month, you don't cut it as often. So, this winter, we have had a bit of moisture. But, more importantly, we have had cold weather. In the RGV, we do not like cold weather. It is a time for soups, teas, coffee, sweet bread, menudo, and just staying indoors. The weather rarely drops below freezing; but, it's cold enough for us. Consequently, you neglect your yard. So, my yard turned into a forest in just a couple weeks. Those weeds grew like it was nobody's business. We even had law enforcement stop by to conduct searches for missing children in our yard. I got the hint and got to work on cutting down the new forest. But, I seriously considered paying somebody to do it. It took a few days; but, eventually my son and I got the lawn tamed a little. The weather is starting to warm up and the rain has not been as frequent. We think we can keep up with our yard. We have dealt with our winter tall grass. If the rest of the year could measure out rain in small, frequent, quantities we would be grateful. Given the long drought, we don't really have grass. We would like the grass to grow and replace the weeds that are placeholders in our yard. Quite frankly, I'd rather have weeds than the dirt yard we had before. I figure we can mow down the weeds to provide a mulch for the grass we hope grows in. 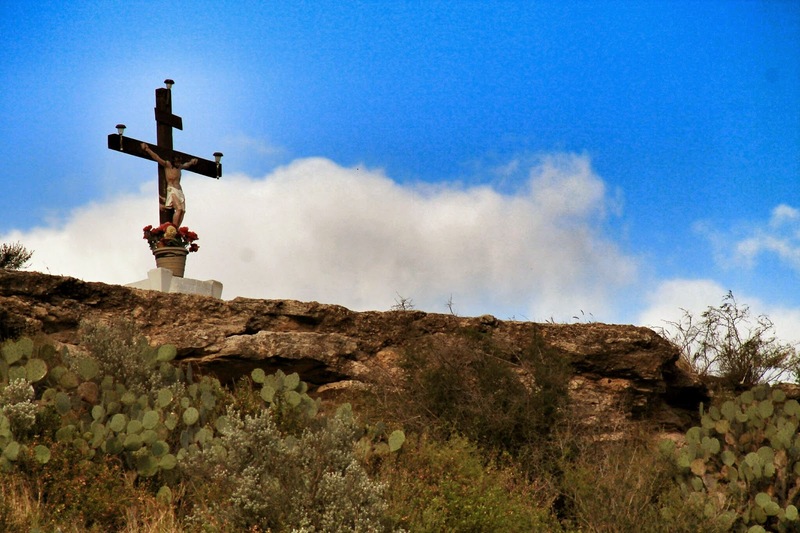 This is the cross that was recently reported as being vandalized in Rio Grande City, Texas. The cross is located atop a hill that overlooks the city as you enter from the East. Railroad Crossing sign near Santa Cruz entering Rio Grande City. You may want to visit the new Cinemark Pharr Town Center and XD, one of the latest movie theaters in the Rio Grande Valley. 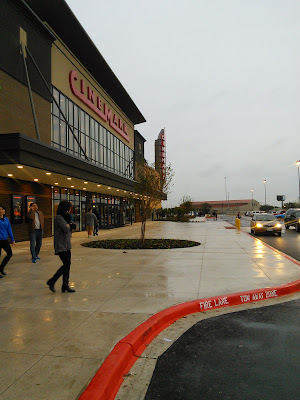 In addition to XD movies, the theater offers additional experience improvements you will not find at other theaters, such as hot beverages, beer, wine, and ice cream. Off course, they also offer the standard fare of hot dogs, popcorn, candy (by the pound), and nachos.